What's the saying? It's great to have friends that own a boat, just as long as it's not yours. Well, does it count when it's your parents that own the boat? 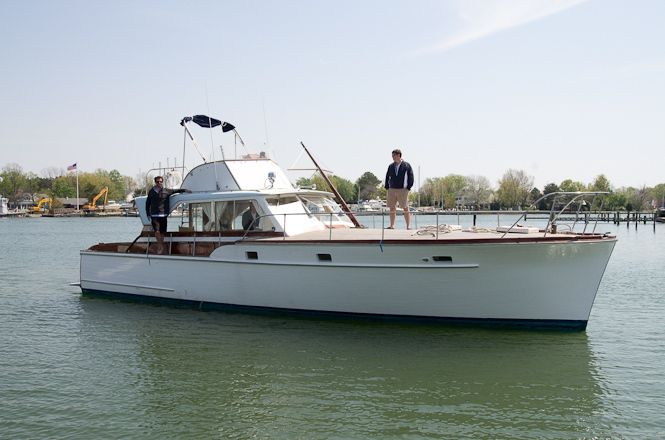 Mom and Dad recently purchased a beautiful wooden hull boat. This has been on their want-to-do list for years... ever since they sold their sailboat after sailing it from the Chesapeake Bay to the Bahamas, long before me! Hopefully it will give me the opportunity to learn a thing about boating as my lack of boat knowledge (it's a whole different language in there) is quite an embarrassment to them! A few weekends ago, she went on her maiden voyage (at least for the new owners). 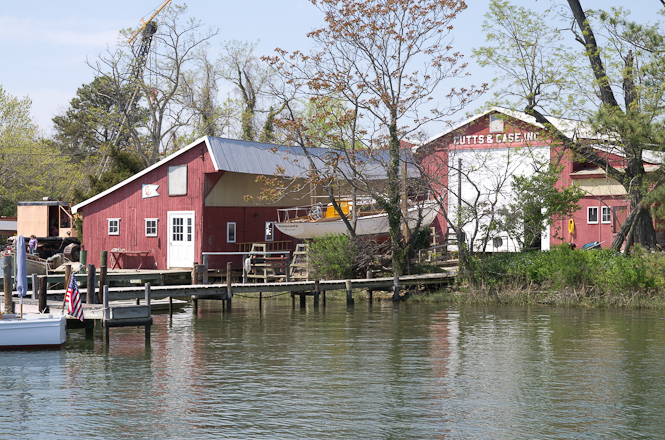 Dad needed to move her from Tolchester, Maryland to the boatyard where she's being beautified in Oxford, Maryland. After a snafu with the captain that was supposed to help Dad with the journey, Andy and his best friend Ben were tagged as first and second mates. While I dressed the part in my new boat shoes, my duty was on dry land... driving the car from Point A to Point B with Mom. Thankfully Ben knows a thing or two about boating (that's an understatement) and Andy was more than willing to learn. As they set off, I think they were both a bit surprised when Dad declared that this was his first time taking the boat out! At this point though, he had navigated his way out of the harbor which involved quite a few turns so I think he'd earned some confidence. Mom and I cruised along, making a pit stop for some crab cakes and outlet shopping before greeting them upon their arrival in Oxford. 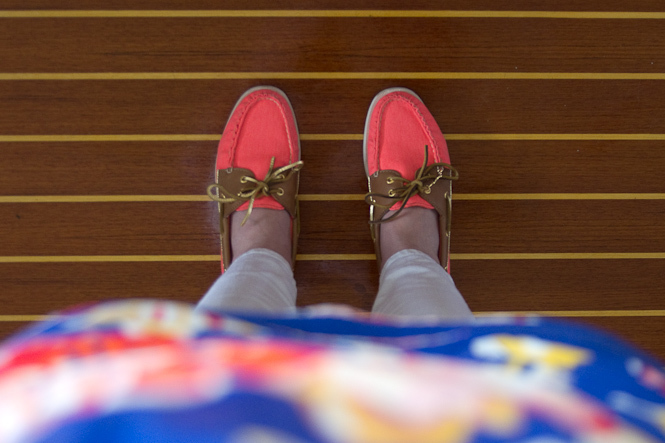 Doesn't the front deck just look perfect for sun bathing (with SPF 50 for me, obviously)? 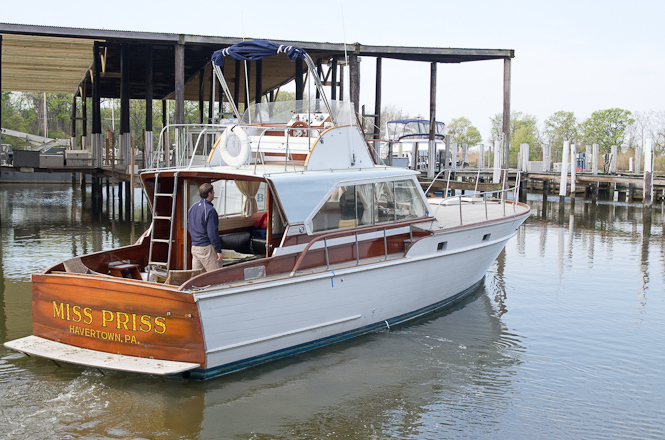 As you can see in the first picture, her current name is Miss Priss although a renaming ceremony, complete with champagne will be held to rename her Dalliance, in honor of Mom and Dad's sailboat. But that didn't stop Dad from saying, "maybe we can save some money and not get a new transom. When someone asks about the name I'll just say, 'I named her after my daughter'". Hmph! 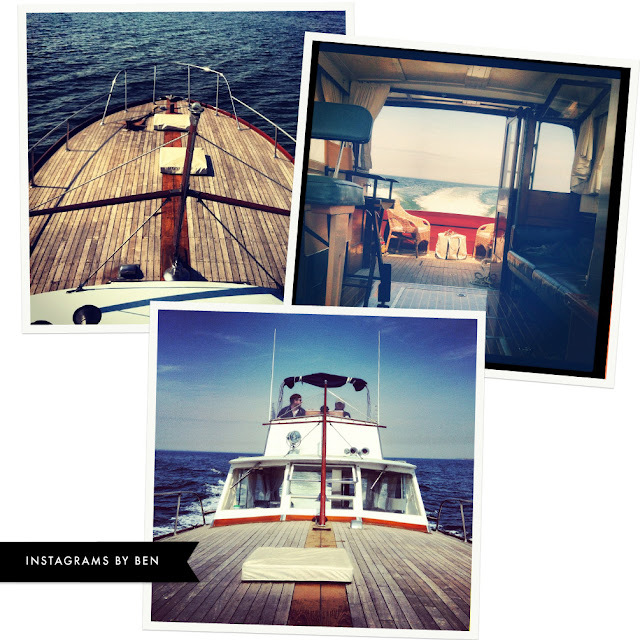 And a few instagrams from the journey courtesy of Ben. BTW, did you know that snafu is really an acronym for "Situation Normal, All F'd Up"? I certainly didn't until I just googled it to make sure I was spelling it right. Per Wikipedia the acronym, "dating probably before World War II, Oxford English Dictionary defines it as 'an expression conveying the common soldier's laconic acceptance of the disorder of war and the ineptitude of his superiors'. It began to enter the everyday American lexicon shortly after the war." Lesson of the day. 1 comment on "Dalliance's Maiden Voyage"
She is a beauty! Can't wait to see her in person. I just learned that about snafu a couple months ago from wiki as well!